Let’s face it, as chiropractors we see a lot of patients in a day and don’t always have the time to sit down and explain why they should include good fats in their diets, detoxify their bodies, or try to meditate regularly. That's why I wrote my book, Hack Your Health Habits and developed it's accompanying online program the Hack Your Health Habits Mastery Program. WHAT IS THE HACK YOUR HEALTH HABITS MASTERY PROGRAM? The Hack Your Health Habits Mastery Program is a 5-module transformational program that walks participants through various aspects of natural health. The modules cover everything from diet, to exercise, to mindset and even detox. Content is delivered via an online membership site, populated with tons of short educational videos, quizzes and amazing how-to practical information. WHAT WILL YOUR PATIENTS LEARN? 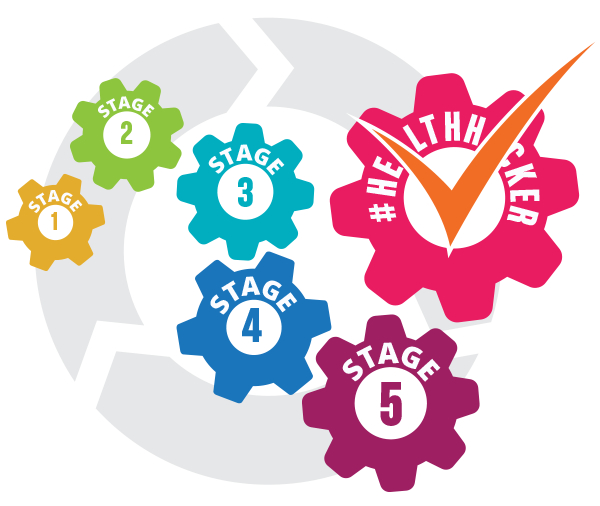 In the preparation module, we review the structure of the Hack Your Health Habits Mastery Program and how it is delivered so that your patients can get the most out of it. We also set the stage for the right mindset and the necessary steps to achieve greater health and reach peak potential. This module is all about gathering information from your patient's current health and fitness status, mindset and lifestyle habits to their nutritional status and toxic exposure. In order to improve on all these aspects of their well-being, it is important to know where they are at. Remember, they can only improve on what they measure. In this module, we discuss the basics and the not-so-basics of nutrition, exercise, and mindset. Your patients will analyze their results from Stage 1 and finally gain greater insight on what they are actually eating, how they are moving and how their mindset is affecting not just their health but who they are. This module will also start digging into what vitamins and minerals they should be integrating more of in their diet. Food for the body and food for the mind. In this module, we will start taking massive action on many of the aspects of health with new and improved strategies to help your patients achieve better health faster. Stress and metabolic hormones, as well as gut health, will be discussed with information that they can apply right away to start seeing their health flourish. Many mindset hacks will be brought to light to truly enrich their emotional life. This module focuses on even more progressive approaches to health covering food sensitivities, hormone imbalances, exercising for faster results and how to minimize toxic load. Your patients will discover the nutrition plan that is right for them and their health goals. Achieving mindfulness and greater quality of life will also be explored. This module is all about cutting-edge information to help your patients take their health to the next level. From genomics to metabolomics and from brain optimization to the power of manifestation, they will learn all about the new innovative tools that are available and how they can use them to literally take control of their health and create the life that they want. In the conclusion module, we review your patient's story and figure out if it is serving them or holding them back. The concept of 10X will be explored. Leadership and mentoring will also be covered because if your patient's made it to the conclusion module they are part of an elite group—a small percentage of people that make things happen. The world needs them to share their knowledge and wisdom. They've made it to the #healthhacker #leadershiptribe. WHY BECOME A HACK YOUR HEALTH HABITS MASTERY PROGRAM AFFILIATE DOCTOR? Receive 40% profit from every Mastery Program you sell. Record a webinar with me promoting the Mastery Program so that you can position yourself in your office and community. Let me help you achieve success! Gain access to graphics and other materials that can help you sell the Mastery Program online and in office.